Gun Work was one of those Hard Case Crime books I had to track down because I missed it in the book club. I'm glad I made the effort. David J. Schow knows his noir, updating the genre deftly to the modern world. Barney knows guns. He knows guns better than just about anything else. It's because of his expertise that he gets a frantic phone call from an old war buddy, Carl Ledbetter. Carl's fiancée has been kidnapped in Mexico and he needs help to get her back. And who better to help out in a desperate situation than Barney. Of course, not all is what it seems. Schow knows what he's doing when he turns up the tension. An extended torture sequence was so horrifically realized I had trouble getting through it. But it effectively set up the rest of the novel and was important to the characters. I'm sort of on this fence about this one, but I'm more likely to recommend it than not. It's a good book with some great stuff in it, but it's not for the squeamish. © 2009 Marty Runyon. All rights reserved. If you're reading this on a site other than Bullet Points, be aware that this post has been stolen and is used without permission. I'm turning rant mode on for this post, so stand back if you want to avoid the flames. There is a persistent attitude in the MMO blogging community that doing the same quests as other players reduces immersion. They feel like their own efforts are for naught if the next person that comes along ends up killing the same ten rats to save the village that they just left. Those people are wrong and here is why. People have abdicated all responsibility for investing themselves in the games they play. They expect the computer to do all the work while they have a passive experience. As computer power and graphics have improved, people have expected more from their games and less from themselves. When I starting playing games on my computer, my avatar was an "@" symbol. There wasn't any color. When a kobold ran up to smack you, a little "k" ran across a field of periods and the combat animation was a sentence: "The kobold hits you for 7 points." And ASCII graphics weren't even around for earlier gamers. They had to read about that kobold running up to them. Someone had to work pretty hard to feel immersion in a game like that, but it happened. MMORPGs actually do a pretty good job of telling stories for their players. There is no indication in game of what quests other players are on. You don't get to read what they're reading. From the point of view of your game client, those people are just autonomous NPCs running around willy nilly, occasionally beating on the wildlife. As a player you can parse out what they are doing, but your character cannot. MMOs have also added cutscenes, instances, and phased graphics to help tell a better story. And the funny thing is that the people crying about immersion are the ones that scream the loudest when these storytelling devices are put into use. When I sit in front of my computer all I can see is what my character sees and knows. My character doesn't know that ten million other players have killed these very same bandits or collected those red bandanas. The least I can do is meet the developers halfway. It may be the poorest form of roleplaying in existence, but that is what we are doing when we enter these virtual worlds. If you're not feeling immersed in an RPG, maybe you should take a look at yourself and what you bring to the game. Based my Free Realms Q&A from earlier this year (and based on my desire for more random Google hits), here is a Q&A for Champions Online based on the search terms coming through to my blog. I went ahead and dressed them up to protect the inane. Where do I go to create my Nemesis? - Two blocks north of City Hall (marked on the in-game map) is a police station. Right outside you'll find MCPD Captain Martin, two Nemesis vendors, and the computer you'll use to create a new supervillain. For the more visually inclined, try this map! How do you defeat Kevin Poe? - Ouch. Okay, you guys got me. I bragged in one of my earlier posts that I was able to solo Mr. Poe and solo him I did. The only problem is I didn't exactly do it in a way that would make anyone, especially Cryptic, cheer for me. After getting nailed to the wall a few times by the fiend, I decided to pull out all the stops so I used one of the summoning devices you occasionally pick up. I don't exactly remember if it was the demon or the gunbot. Whatever it was did the trick. And I do mean trick. After deploying my pet, I charged in and started blasting away. Kevin Poe started blasting too, but at me instead of my pet. Gah! Down again I went. Only this time when I revived Poe did something strange. He must have still been in combat with my minion because pretty soon the villain ran all the way out to the revival point. With only 45% of this health left, I was able to finish him off and complete the quest. I'm not proud. Of course this was in the days before Force Shield and Regeneration. Maybe with a good build I could do it the right way this time. What's this about a Crime Computer? - Crime Computer! Great question! (Thanks for changing the topic!) Never used it once. Maybe once. See, the Crime Computer is an option at the bottom of your Mission screen. That's the one that comes up when you hit "J". The purpose is to point out quest givers in the various zones that you may have missed. Champions already does a really good job of leaving breadcrumb quests for you, so I've never been that lost. But if you really aren't sure where to go next, the Crime Computer will point the way. Maybe even several ways. UPDATE - The anonymous MM in the comments reminds us that there are a few quests that become available in the Crime Computer in the level 20ish region. No idea why they ended up there. No real story to it. Just another way to dump missions on you. So take a look because you definitely don't want to miss extra XPs. Where is the tailor in the Southwestern Desert zone? - I feel sorry for this poor guy. It seems like no one even knows where to find him. The guy you're all looking for is named... logging in really quick... Supply Officer Thompson. You'll find him by the tents down on the grassy area of Project Greenskin, east of the Powerhouse and northwest of the landing pad. There's not much reason to go down there, so it's no wonder people don't find him easily. If you're looking for the donations guy so you can buy your hero points back, he's right there too. Where do you find the half-mask option? - This one took me a while, too. Let's see if I can remember. From the Head costume tab, first choose Heads & Hairs. That's the default, so it's hard to miss. Then select the Head Type option on the left. The first drop-down menu on the right side is Costume Piece. Click that menu and you'll find Partial Mask is the second option down. You can change the look of the mask from the Pattern drop-down menu. Also in the interest of full disclosure, I didn't remember any of that. I had to look when I checked for the Desert tailor. Do you unlock a costume slot at level 50? - Maybe. However since the level cap is current forty, let's go with the ones we can obtain at the moment. You get extra costume slots at levels 15 and 30 as well as a bonus slot for joining a Super Group. Since you can invite your own characters to a group, there's no reason not to bring alts in and get your free costume. Rubberbanding in Champions? - I must have missed that power framework. Sorry. Champions Online vs. EVE? - What do you want them to do? Fight? What the hell is wrong with you? Can you solo in Champions Online? - For the millionth time, yes! I'm sorry, okay. I was wrong. Can't we just let it go? Can Champions Online be played offline? - Oh, forget this. I'm through here. When we lived in Seattle, she worked for a large high-tech company and I worked in a record store. There were real vinyl records there, though most people came in for the CDs. That's how we met. She said that even though she works with technology all day, she thought music was better before it went digital. I might have professed my love for her right there, but I didn't want to come across as that creepy guy. We stayed in Seattle for two years until she got a better job opportunity in San Jose. None of the music shops were hiring, so I ended up at the gym where she works out. It was nice to have her around while I worked, though she had to stop working out in the evenings after a few months. I think her boss was keeping her late with too much work, so that was disappointing. He was pretty rude when I told him stop pushing her so hard. Lucky for him I kept my temper or he would have spent longer than a week in the hospital. San Jose only lasted about 15 months. I don't think California was right for us anyway. We ended up in Boise next. I don't really know why she chose there. We didn't stay long either. I had only just started at the Cheesecake Factory when it was time to move again. Not that I minded; those cheesecake eating jerks didn't tip for crap. There was a pretty big mix up after that. She forgot to tell me we were moving to Minneapolis, so it took me five months to find her again. I went to her apartment to let her know I finally got here, but things got a little heated. I felt pretty bad about it and tried to apologize about her windshield, but some moron called the cops and I didn't get a chance. Now that we're in Cleveland, I'm trying to give her some space. I know I rushed things, so taking it slower can't be bad. I still think we have a connection, so I'm not willing to give up on us yet. She has a very nice apartment and a new job. I think she's happy here. I think we'll be happy here. As long as that neighbor of hers keeps his hands to himself. Otherwise I'll kick his teeth in. Stuff is getting worked on. An announcement is forthcoming about improvements to grouping, including improved information and mission sharing as well as better rewards. Cryptic would like to include adjustable difficulties for five-player lairs: from turning them down for fewer players all the way up to epic levels. Daeke: Hello everyone! Thanks so much for joining us today! Daeke: We've got a bunch of questions from you, so let's do some quick introductions and then hop right into it. Daeke: I'm David Bass, Community Representative. Daeke: And apparently I'm the only one here. Chronomancer: Welcome to the chat, everyone! Bill Roper, here - Executive Producer and bender of time. Daeke: Okay! Let's get started. [Silatt] What errors in your process have you identified that lead to allowing the September 22 patch to go live despite potentially game-breaking bugs? What steps are you taking to better test future patches and make sure that such an error is not repeated? How will you better involve the public testers that were able to identify issues before this patch went live and were largely ignored? Why was this patch rushed with minimal time to test on the public test server? Chronomancer: We've been running at top speed to address the issues and desires that players have expressed. The patch we pushed on the 22nd was intended to explicitly get the economy fixes out to players to address the retcons cost concerns and fix the overall economy model of the game. This happened at the same time, however, we were transitioning to using the new Public Test Shard and the new PTS forums. In our rush to get the economy fixes in, we missed the other issues. The players did a great job of letting us know what was wrong with the build, but we didn't have our devs and testers moved over to looking at overall issues yet - we were really focused on the economy changes. Moving forward, we're not only spending more time on the PTS forums, but we're also going to be slowing down a bit with changes to keep the quality and flow of information to the players high. [WebGuest78] Can we expect to see disadvantages like in the pnp game - ie. take a disadvantage to earn some development points? It'd be nice to see my ice person actually weaker to fire. [Shiroi98] Why the decision to cap damage at 32% from superstats? The game is hard as it is already, even if the mob damage was apparently decreased. [NightsD] Is there going to be an adjustment of threat generated by healing powers and support and tank roles be rewarded for doing their job in Open Missions in any point in the future? Balseraph: Healing Threat - There are several angles to this. First: Right now on live, heals generate threats against EVERY enemy in range. What we're experimenting with internally is this: First, heals only generate threat relative to the threat the person you're healing has. That means that healing the tank only puts threat on enemies that already hate the tank; or, healing doesn't make much threat at all vs. adds or accidental pulls. Next, every enemy attacking a healer reduces that player's healing threat. Here's an example of what we want to happen (please forgive the assumption of "traditional" roles; they make examples easier). The tank has three people beating on her. The healer isn't careful, and does heavy overhealing (which, yes, we WANT to count for your threat! Keeps healers on their toes. =)) and pulls aggro. Rather than all of the enemies running to the healer, only one enemy, starting from the lowest ranked (henchman before villain, etc.) will go after the tank. The healer's threat from healing is reduced as long as that enemy is on the healer. If the healer defeats that enemy, their threat goes back up, and if the tank isn't holding aggro, another enemy may break off at that point. This should make the battlefield feel very fluid, but still be more predictable than it is now. One of the core ideas of Champions is that everyone is a Hero; there are no "pure" support "classes", and that everyone should be able to easily dispatch a stray Henchman, and feel powerful and heroic defending themselves. [Captain_Skyfire] What is Cryptic's stance on group 'roles' such as tanking and support. Do you want these to be pronounced in teams or are they just options that players aren't forced to use? Chronomancer: It will depend on the content, and overall the team will be more effective if they can use the roles. If one player is holding the attention of the really dangerous enemies, the team will benefit as a whole if they are in the Protector role (defense) and all the heroes who only have henchmen attacking them are in Avenger (offense) or Sentinal (support). If your team just goes in for mass blasting and every player is expected to take care of themselves, Guardian (balanced) is a reasonable choice, so it basically comes down to playstyles and content. Overall don't be surprised if you find you need to use your roles effectively - they aren't classes and you can switch them as needed during a play session. [GreySky] Will we see a point where using Offensive passives will be possible soloing? I would love to try them, but without defence, it's way to hard. Chronomancer: Our examination of our data shows that players can use Offensive Passives successfully while soloing on Live, though many are also using Defensive Passives, or none at all. Having said that, we are definitely looking at the relative powers of all the passives and will be paying special atention to offensive passives. [Ryu_Kitsune] I got a question...are there going to be more quests added at 39-40? Arkayne: We are looking at adding more content across the board. On the technical side we've got a bunch of new tools for creating content quickly, especially instanced maps. You can expect to see a constant flow of new missions and story arcs throughout the game, in addition to our larger-scale expansions. [Spitfire5792] Should we expect anything new for supergroups such as a supergroup base? Or friendly sparring between supergroups? Chronomancer: We have a long list of desires for supergroups that include things like bases / headquarters. But we first want to develop a system that encourages supergroup play by giving these large groups of heroes goals with rewards. I'd also love to come up with a way for the biggest and best to have persistent bases in the game world that everyone can see. [Dardove] Are there any plans to reward healing and tanking in open missions? Arkayne: We'd looking into ways to evaluate healing and tanking in Open Missions so they can be factored into contributions for rewards. It's in the queue for programming but we don't have an ETA for that yet. [IveDefected] Will there ever be a way to sort inventory? [GameTaco] I might as well ask a hybrid Crafting/Unity question: Are the parties involved at work on adding in the Unity HQ crafting tables where we use our Qliphotic essence? For that matter, what can we expect from Unity in the near future, if only once more players have reached the 40 mark? Antiproton: Yes, I've got more UNITY Crafting on my list, there will be Blueprints going in to use the Qliphotic Essences. You won't use special crafting stations, it will work at any of the existing ones, though you will need to acquire the Blueprints from the UNITY activities. [neuroid] Will we see any new community tools that support guilds? Daeke: We've got some great ideas planned for tools we'd like to provide Supergroups with in the future. Currently, our focus is on stabilizing the game and letting things settle down after launch, but we're always thinking ten steps ahead to determine what tools would be useful to the community. Make sure you keep using the Suggestions Forum, because we're always looking through it for ideas and suggestions from you guys. [Globex] What can we expect on the current status of certain powers that yield little or no benefit and have gone untouched? Such abilities like: The Aspects (Dragon, Inferno, or Celestial), and Cloud of Flies? Will these be buffed and yield more benefits or will they remain unchanged and just be left to incure virtual dust? Chronomancer: We have just gained an amazing data tool that allows us to see what powers every single hero in the game is using. This will allow us to very specifically address powers that are below the curve, and those that are will be increased in effectiveness. If they are appropriately powered but nobody is taking them, that gets more complicated. Aspects and Foci are of things that need to be buffed. We want every power to be desirable so that players are at least considering taking it. They may be specialized and only appeal to a small subset of builds, but there needs to be some use for them. [Ardrikk2] When can we buy more character slots? Chronomancer: We'll be expanding what players can get through the C-Store next month, and that will include the ability to add more character slots to your account. We're still implementing ways for players to earn them, but I don't have the specifics for you - tech and design haven't synced up yet. [Ashpolt] Why are there no new inventions in crafting after you reach skill level 300? Is this intentional, or just lack of content? Will it be fixed? Antiproton: There are crafting Blueprints all the way up to skill level 400 at the moment, you need to go visit your specialty trainer. For that matter, from 200-300 there are some Blueprints that you need to visit the specialty trainer to learn. [WebGuest46] What is the ETA on the Danger Room for the Powerhouse? Arkayne: We're working on Powerhouse 2.0 right now. This will include the "no-duel" power selection/retcon area, testing areas, and the "danger-room" style test versus opponents. Barring any complications and feedback from the PTS we're hoping to get it out within the month. [Thewolph] What is the process from start to finish of how a power change comes about? Who initiates the idea? Is it based solely on lots of number crunching? Player "suggestions"? A combination of the two? My assumption would be a combination of the two, but I am not in the business and can't say for sure. Chronomancer: Yes, it's definitely a combination of the two. The powers team gets feedback from other designers, reports from CS about issues on the forums and bug reports from players, reads the forums directly and discusses hot issues, and gets lots of detailed bug reports from QA. In short, number crunching plus lots of reading and talking. Every forum thread is useful feedback, and even more important to us is every bug report that gets submitted with /bug. Antiproton: The powers team spends a lot of time discussing all those things to decide what we are going to be working on. [Leatherhead] I know melee is tuned to do higher and more efficient DPS, but melee builds really need to have better burst damage than ranged attacks. This game is extremely dynamic and mobile causing melee up time to be quite low. Charged attacks on a melee character are quite a pain due to dynamic combat, notably the extra long charge on haymaker. Perhaps a different mechanic is in order, such as building up a secondary resource alongside energy in order to power the big attacks? Chronomancer: In PVE this is mostly not an issue. While enemies moving to range at just the wrong (or right if you look at it from their point of view) time can be frustrating, overall the higher DPS once you get in close - especially with judicious use of terrain - can be highly effective. For PVP we've tried to address it with abilities to root and control, and we certainly want it to be a viable option. There are some killer Might-based PVP builds, but as with all of the power sets, we'll continue to tune and tweak. [WebGuest50] I like the Grond look, is there any chance you will add a feature for four arms on a hero? Chronomancer: We would have create a special and specific animation rig and costume set to be used with a four-armed look, so while it would be VERY cool, we can't put this into the costume creation system without a lot of work. Daeke: We'll be right back after a word from these sponsors. Foxbat TV: Your source for everything Foxbat. [WebGuest85] Any plans to add epic unlockable sets to the game once a player hits 40? Antiproton: Yes, we're going to be adding item sets, with possibly some interesting new wrinkles as well. The intention is to make sure there are interesting things to accomplish, as well as enough time to enjoy what you've done to improve your character. [IveDefected] Are World Events a large portion of your planned content, if do they revolve primarily around real world holidays or does the Champions Universe get its own unique Celebrations? Arkayne: A lot of the events we'll be having in CO coincide with real-world holidays, but we're also considering events that are not linked to any special holiday but are just cool comic-book events. How cool would it be to have the Lemurians attack Millennium City? That sort of thing. [Fabled] What can we expect from the Celestial power set ? What makes the power set stand out? [Rizzon] The Tutorial might be the part of the game least enjoyed by players, will we see an update of the Tutorial? Daeke: So, we sort of caught up on our backlog so bear with us for a minute. In the meantime, make sure you stick around until the very end of chat, because we have a special prize waiting for one lucky attendee. [WebGuest05] Will there be a visible benifit to teaming over soloing other then just getting crap done faster? Chronomancer: We're working on a lot of enhancements to the teaming system, both in how we share information amongst players that are sharing missions, and on actual mission-sharing mechanics. It's *slightly* too early to talk about the big technology change we're working on in the next week or so, but it will greatly increase the fun and benefits to teaming. I know this is a bit of a tease, but it's something we haven't really seen in an MMO before and I want to be sure we have it in and working before I detail out how it works. [Satelite6] 6.5% chance of doing something at the cost of 30 or 70 attribute points is totally not worth it, even with the new 32% cap, will you guys be doing something about the nerfiness of power replacement items soon? Balseraph: The softcaps I'm working on (that Antiproton discussed earlier) will address that; my explicit goal and desire for stats is this: Every stat should be good for everyone, period. The choice of which stats you take should depend on your chosen play style, not "what's the most effective build". We'll be dramatically improving the payoff for low and medium values (but applying diminishing return). To give you an idea of where things will end up, whatever stat value gives you +30% damage is the targeted balance point. Stat values lower than that will get more valuable. The payoff for Stat values higher than that will be diminished. Tuning power replaces is (currently) the next major item balance step after that. [--xAJx] Q. Are there any futher plans to make the bank storage bigger? I am taking over the storage in the SG bank atm, and getting hasslehoff for it! Chronomancer: Hmmmm... if you can't already exchange resources for more bank slots, I think that's a bug. We'll track that down after the chat. Arkayne: The Reinforcement system is intended to provide a challenge for larger groups in persistent world areas. Just like heroes team up to take on greater threats, so do villains. Usually there's a "tell" associated with Reinforcements, like a guy running off saying, "I'm going to go for help!" If you stop him, he doesn't pull the next group of villains. We're looking at making a few tweaks to Reinforcements, including varying types of Reinforcement backup. Chronomancer: Speaking as the voice of Foxbat, you can damn well bet the greatest and most gastronomically conscious of all villains will be featured in upcoming content. He's the fabulous Foxbat! Say it with me, people: FOXBAT! FOXBAT! FOXBAT! Antiproton: Um, yes, you are supposed to be getting 40 for completing it, I'll go and check on that after the chat. In general if you see strange stuff in game where the rewards seem off, /bug it, please! Daeke: Dum dee dum. One moment, please. [Ursan] Are you intending to keep changing skills or do you think adding more skills would be better for maintaining the enjoyment of your customers? Chronomancer: We're going to be both looking at existing powers and making new ones. I think to address the needs and desires of the players, we need to get the powers in the game fixed and fun, and then make more! Daeke: Remember, stick around for a chance to win a prize at the end of the chat. 5 minutes left, folks! Arkayne: Yah, we've been talking about Difficulty sliders for instances. Lot's of people have requested "epic" versions of instances for bigger challenges and rewards. We've also been discussing lower-power versions of the 5-man Lairs so smaller teams can take them on. [WebGuest81] Will there ever be improvements to the chat system? For example, making the different channels "sticky" when you type in them, shortening common commands like "/team" to "/t", putting numbers on custom channels like "/1" etc.? Chronomancer: Yes. We have along list of things we want to do, but it's all a matter of time and resources. Better in game communication is in the queue, I just don't have a specific time frame. Daeke: We've got time for one more question. Stick around after it for a chance to win a special prize! [Delkas] Is there any plans to rebalance the defensive passives up to an equal level? Anyone with both a regen character and a PFF character will know what I mean. Balseraph: Defensive passives - Of *course* we want them all to feel equally desireable. Mathematically, they ARE all balanced... given certain narrow assumptions. In practice and in the real world, those assumptions don't hold up as well as they do in development and practice. I agree with your assessment that, currently, Regeneration is just easier to work with than the others, particularly given how well it works with Block. Assuming we want them to actually FEEL different from each other (and you all do still want that, right?) making different defenses that function differently in different circumstances AND are balanced... well, it's going to take some work, and we'll be asking you to jump on the PTS and help us out in testing them as we iterate on them. I will say, though, that making the Offensive passives (and the Aspects, and the Focuses) more appealing is a much higher priority. Well, first to answer it CORRECTLY. Arkayne: What famous siblings in the Champions Universe were raised in a witch coven? Daeke: Congratulations! I'll be getting in touch with you in just a minute. Thanks again to everyone for joining us! Chronomancer: Thanks for coming out, everyone! See you online! The blame for today's post can be shared equally by Jayedub and Snafzg. They are the ones responsible for me not playing much Champions this weekend. In the last month or so, there has been growing sentiment that maybe Warhammer Online deserves a second chance. Or third chance in my case since WAR wasted its second a few months back. Although I had fun running through tier one solo that time, the nearly empty server was enough to drive me away again. Sometime Thursday night, I figured it couldn't hurt to reinstall just in case. So I dug out my collector's edition, let it run over night, and swapped disks the next morning. (It's not like I was going to use my computer while sleeping or at work.) When I got home Friday night, I remembered that you can't patch the game unless you have an active subscription. Jeez. I decided that maybe it was time to look again. Mythic has done so much to the game in the six months I was away. Might as well take the plunge. Fate must have been on my side though, since the account page informed me that I was eligible for the ten day Welcome Back trial. There was really no point to not signing up in the face of all that. As has happened each time I've tried to get back into the game, I've forgotten exactly how to play my character again. This isn't a tragedy since I love rolling new characters and the tier one zone are still considered the high point of the game. Here Mythic doesn't disappoint. With all 24 classes back in the game, there is a lot of variety for every taste. For me, though, I've had enough of Destruction and decided to return to the class I originally wanted to play: the Witch Hunter. When I arrived in Nordland, it was nice to see the hustle and bustle new characters running around the world. I was able to jump right into the quests. Public Quests occasionally drew attention, though I've only been able to complete one Normal PQ and none of the Hard rated ones. Best of all, scenarios were popping (ugh, I don't like that term) with some regularity, even ones that weren't Gates of Ekrund, the focus of this PvP holiday weekend. And the RvR was alive and well with warbands fighting over the various objectives. It wasn't opening day, but it also wasn't the vast emptiness I remember from six months ago. The Witch Hunter is quite familiar though the exact details of play are only slowly returning to me. There is fun to be had running around, cutting up people and beasts, shooting them in the face, then continuing on to the next red splotch on the map. The game looks great, even at the default settings. Since I previously had to turn down details to get it running smoothly, it seems like an extra six months have helped that. What hasn't improved is the responsiveness of the combat. I can barely tell which of my abilities are going off at any one time. WoW, and now CO, have shown that doing this right really drives the experience. The ability lag disconnects you just enough to break the feel of combat. So far, that's the only issue I've had with the game. I was able to clear tier one with my fill of RvR and quests and moved on looking forward to tier two. Whether this subscription will continue past the ten day trial, I can't say. I'm sure it will all come down to how active RvR and scenarios are this coming weekend. At a minimum, I'm pretty happy that I gave up the hard drive space to take WAR out for a another spin. Considering how little I like to group in MMOs (I know, I know), I was astonished to find myself asking for teammates to take on Dr. Destroyer's Factory. Even more astonishing, I found four other heroes willing to assist me in defending Millennium City from the robotic horde. Dr. Destroyer's factory is quaintly hidden behind and below this painting of the villain himself found in the Battle of Detroit Museum. There is a nice little quest series from Doctor Silverback and Microman that has you investigate the museum, discover the factory, and then remove the threat. It's the very definition of theme park questing leading to the big ride, but the whole game is like that. The only difference here is the ending instance is can't be soloed. Lucky for me, Cryptic's goal of downplaying the holy trinity really works. Walking in the front door, you'll immediately notice a quest tracker, like those found in the Open Missions, directing you how to progress through the instance. At first it's shutting down a couple terminals to disrupt the factory. Later in the instance you come to a puzzle that requires you to use an overhead magnet to load parts into a robot-making machine. It was cool to have a real puzzle in there, but my little group was having trouble figuring it out. It's probably meant for four players to each stand at a terminal and work together, but it was just easier to take over and do it myself. The very next thing you'll notice is all the henchmen and villains, all marked Tough. If you've had the misfortune to run into any before, you know that you're in for a fight. It turns out that as long as people don't get too crazy pulling bad guys, the chaos of combat is perfectly manageable. One of my teammates ran the little healbots that did a good job keeping everyone up. But with five heroes all beating up the bots, things went boom pretty quickly. And everyone got to participate in the destruction. Okay, we're back. At the end of the instance, you find a robotic duplicate of Dr. Destroyer overseeing the construction of a massive Destroyerbot. Perfect! The duplicate did wipe us out once, but we ended up zerging it down eventually. When the big guy woke up, he had a lot of hit points but not enough smashiness to finish us off. The heroes won through in the end and I had a great time. Anyone hoping for a highly technical encounter will go away disappointed. But if you enjoy the CO aesthetic of "big action, big fun," you're going to get that times five (because of the number of players, see?) here. Teaser: Come back tomorrow for the reason why I haven't been posting the last few days. Someone where I work recently passed me a link to a Nerve.com article, "20 Classic Douchebag Quotes." I thought it was pretty funny (and scary), so I clicked the Amazon.com link to the book from which the quotes are drawn. Dan Brown might want to get on the phone with someone at Amazon. Or maybe a lawyer. If I've learned anything about the internet, it is this: there is no shortage of opinions and no two are alike. For instance, compare this review from Gamespy with this review from IGN, both about my jeu du jour, Champions Online. Both reviews bring up the same issues with the game. However the IGN reviewer was better able to overlook the problems and enjoy the game while the Gamespy reviewer was stymied by them. Reading those two article, I couldn't help but wonder if I, too, was purposefully overlooking the game's problems just because I was having so much fun playing it. My own first impressions are almost devoid of criticism. Compare that to Syp's Pro and Con lists. If someone called me a CO fanboy, I would be hard pressed to refute the claim. I am a fan of the game and I want to see it succeed. I agree with all the issues everyone is raising, but I don't really care. I'm having too much fun playing for that to get in my way. And I don't see why that's a bad thing. The bad rap that fanboys get is well deserved. Some people love a thing so much that they defend it to irrational lengths. And in the process they make the object of their fandom seem all the more foolish. I hope that I never slip into those murky depths. However I sympathize with them, if not their methods. There is nothing wrong with loving something in spite of its faults. But then earlier this year, I was similarly enamored with Free Realms. I wrote a clutch of posts, had a great time, and then I cancelled my subscription and haven't played since. I'm not going to be cancelling my CO subscription any time soon. (Lifetime, remember?) But I wonder what will be the reason I stop logging into Champions. Can I only be blinded by the fun for so long? 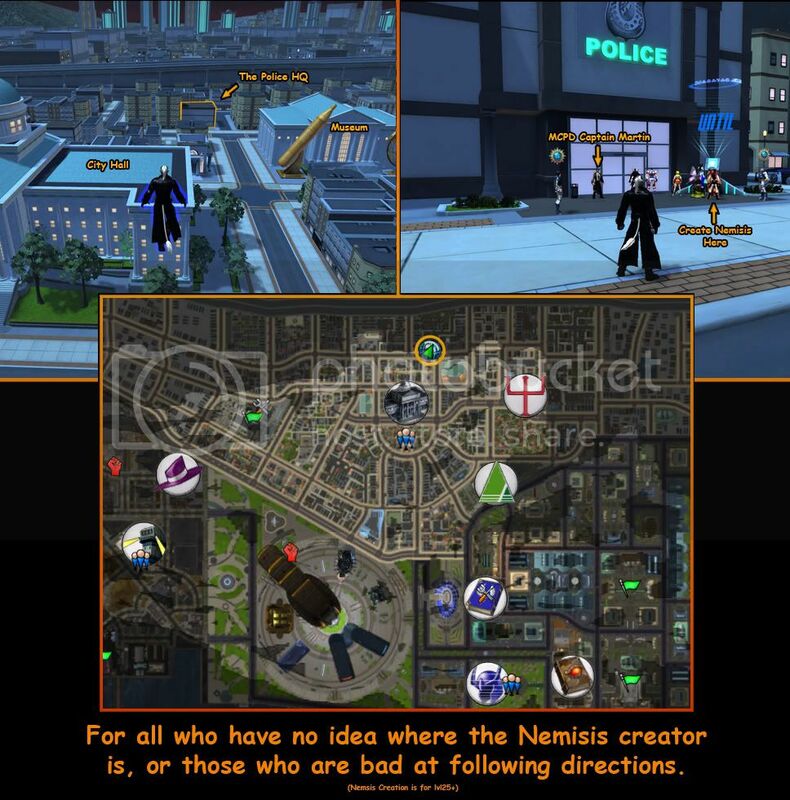 As I mentioned in my first impressions post, one of the things I've been looking forward most to in Champions Online is the Nemesis system. From everything I had read about it, designing your own opponents seems like a perfect way to give soloers like myself an endgame of perpetually generating content. And leveraging the character creator, one of the highlights of CO, is a stroke of genius. Meet Necrosis. (Stop chuckling. I'm really bad with names.) Since my hero's powers come from the fire elemental possessing her and keeping her alive (I said stop laughing! ), I thought the demonic slaver that the elemental was fleeing from would be an excellent first nemesis. I made him a mastermind, gave him infernal minions, and gave them all darkness powers. Sounds like that's a popular combination. It's also a powerful one because the Darkness power set has a life-draining power. Oops. Right after creating my nemesis, the police captain lets me know there is a disturbance at the museum. What a coincidence! So I hop over and get into the hugest fight I've seen in the game. This museum is absolutely crazy. Mordicus on the CO Forums has already stated that they're reconfiguring minion groups to to cut down on the number of villains. Some of the groups in there were two villains and two henchmen. It took everything I had to make it through. When I did, though, it was very satisfying. Who says you can't make solo content challenging? As an aside, the secret of beating Darkness minions is Block. I've become good friends with my Shift key. After besting my nemesis (after a long, long fight, damn life drain), I was suddenly running into groups of infernals everywhere I went. And they loved to pop up right in the middle of a fight with another enemy. I wiped out several times that way, which only made me angrier at my nemesis. The real purpose of the attacks is to give you missions to stop your nemesis's schemes. For some reason, his infernals were scavenging a downed Qularr ship. I also had to blow up some chemical filled trailers again guarded by a legion of infernals. Then Necrosis decided to take over the city with mental control waves broadcast from WCOC. Time and again, I confronted him and his minions and saved the day. Finally Necrosis flipped his lid and decided to blow up the city. So much for his grand plans. I almost felt sad for him. Up until the point where he blamed me for all his failings, as if he weren't such a lame villain to begin with. So I had to put him down for the count. Defender and the police showed up and locked Necrosis away in prison. In the recent dev chat, Bill Roper mentioned that we'll be creating a total of eighteen (18!) nemeses over the course of our heroes' careers, but I was still sad to see my first locked away. Of course, this may not really be the end of his tale. Who knows? That is exactly why I love discovering games for the first time. With this first nemesis in the bag, I'm ready to declare the Nemesis system a win. I like getting to customize my experience. And I absolutely love that it is tailored as a challenging solo experience. As long as there are enough potential missions to keep it from becoming repetitive, I can see this keeping me busy for a long time to come. An Alien World - If there is something to make a superhero feel truly epic, it would be to put them on another planet. You can do so many things there like fighting the evil dictator, stop an interspecies war, or confront a galactic power. You can also use the opportunity to make your hero start as an unknown and increase your fame as you take on your enemies. An Alternate Millennium City - The alternate future is a classic trope in comics and Champions needs one. I want to see an alternate version of Millennium City under the thumb of Dr. Destroyer, patrolled by Destroyerbots, with a small human resistance fighting back. Want to make it really cool? Have the final mission end with the heroes being sent to reality just as Destroyer blows up the world. Hey, comics can be dark. A Historical Time Period - I don't care when they choose, but adventuring with pulp heroes from the twenties and thirties, golden age heroes around World War II, or silver age heroes in the sixties would be a lot of fun. And you can fill out the history of the Champions universe. A Large European City - London, Paris, Rome, Moscow, it doesn't matter which. Blasting villains in and around major landmarks would make for some epic set-piece battles. MMOs are international and superheroes (and villains) come from many places. Champions should reflect that. While you're at it, how about Beijing, Tokyo, or Hong Kong? Small Town USA - You can blame this one on Ed Brubaker and his amazing run on Captain America. In one of the story arcs, AIM has set up an R&D facility in a small town in rural America and Bucky (since Cap was dead at the time) has to take them out. I love the idea of superheroes fighting crime somewhere outside of Manhattan, so a rural town with large tracks of pastures and farm lands would be cool. Agree, disagree, or make your own suggestions in the comments. It was only February of this year that I reached my one hundredth post here on Bullet Points. It only took seven months to reach this next milestone. I'm more serious about blogging now. And I'm having more fun, too. So I want to take a few moments to reflect on how far I've come and where I'm going. Posts over this timeframe have been marked by two major releases: Free Realms and Champions Online. My bullishness on both games saw me posting time and again about them. This in turn has increased my traffic from Google. I don't know how many of those people ever come back to the blog, but it is a nice stroke of the ego to see people poking around. As well, I've kept up with my promise to review all the books I've read this year. I'm only one review behind now, but I'll get to it soon. It's hard to write reviews when there is so much else to talk about. I try not to take it personally that I get so many fewer readers on those days. Traffic on the site has increased from the ten to twenty hits a day I was getting beginning May 12. That was the day I took a poke at the Shut Up, We're Talking podcast over their avatar-as-token discussion. It may have been a negative way to go about it, but numbers don't lie. That was the post the opened the blog to a wider audience. Since then, I have to be thankful to Tipa from West Karana and Syp from Bio Break for occasionally linking the site. Every time they do so, I see a big spike in hits. The biggest spike, though, came from the link to my head start impressions from Champions Online Daily News. That's quickly become one of my top five posts along with the Be Imba post and three Free Realms posts. The best thing that's happened in this last one hundred posts is getting to know some of the people who read the blog, even just a little bit. So thank you to Yeebo, Ardwulf, Jayedub, the recently delurked Zeno, and all of my other readers and commenters for encouraging me to keep going. I don't foresee Bullet Points changing much anytime soon. Unless I burn out on Champions and my posting cuts way back. I'm sure some of you wish I would. I'm looking forward to the next hundred and I hope you'll all stick around to see what's in store. This post is a sequel to my prior article, WoW and The Next Game. You all have Ardwulf to blame for me writing this. So if the last thing you wanted was even more half-baked thoughts about the future of MMOs, let him know in the comment section. The problem is: he's right. The topic of "What the next big MMO will be?" invariably converts to "How do you beat World of Warcraft?" Much like I did in my article, there is some pointing at EVE Online, a lot of nodding, then the game is dismissed. But no one really talks about it. I briefly touched on RPG philosophy before. But to give EVE its full due, I have to bring out the big guns. In this case, I'm referring to Ron Edwards' GNS Theory. This is just my perspective on the theory, so read that article if you want more info. Since I'm going to butcher this badly, I prefer if nobody mentioned this to Ron, okay? GNS Theory describes three axes of player behavior in role-playing games. The acronym refers to the axes of Gamism, Simulationism, and Narrativism. I personally refer to them as axes as games rarely adhere strictly to just one behavior. Although this is primarily a theory of pen-and-paper role-playing games, I find it has bearing on where MMOs came from and where they are going. And it also relates to why EVE gets left out of a lot of conversations. Computer games, by their nature, lend themselves to the gamist and simulationist axes. There is no negotiation with a computer with regards to story and theme that allows for more than the most cursory of narrativist considerations. Thus computer games tend toward two extremes: creating a challenging experience or a compelling simulation. Computer RPGs, thinly veiled implementations of the Dungeons & Dragons rules, took bits and pieces of gamism and simulationism as its inspiration did. Then when CRPGs go online, the potential for human interaction allows these axes to be more fully explored. That's where we are today. On the gamist end, we have MMOs like Free Realms, Warhammer Online, and, of course, World of Warcraft. These are games that rely on overcoming challenges. Almost all video games lean toward this paradigm currently because the electronic medium is very conducive to that style. On the simulationist end, we have virtual world games like Ultima Online, Darkfall (to an extent), and EVE Online. Triumph in these games arises from fidelity to the world vision. Computer games are also excellent at enforcing simulation, but time has proven that simulation is a hard sell to the game buying public. Even The Sims has tended toward the gamist axis with each new version. EVE Online is a triumph of the simulationist paradigm. CCP has created a virtual world (or virtual galaxy, more specifically) that allows players to live the capsuleer's life under very specific rule conditions. Within the terms of the simulation, you can do anything you want. You can create any story you want. This is the problem for EVE in these conversations. Gamist MMOs and Simulationist MMOs will have very different audiences because they are designed to meet different gaming needs. EVE and EVE-like games are not the answer to question of the next WoW because it's not talking to the same people. So when I pose the question "What comes after WoW?" the MMO community has fractured to such a degree that the answer must be a Gamist one. EVE Online can't be the answer because gamist players aren't looking for a simulationist game. In the same way, one would not suggest that a dissatisfied EVE player pick up WoW as an alternative. When it comes down to it, the problem of EVE Online is not that they aren't invited to the conversation, it is that they are speaking a different language. Back in August, Darren from The Common Sense Gamer joined the chorus of bloggers growing dissatisfied with the current crop of MMOs. Specifically, he's tired of everyone copying World of Warcraft instead of innovating. While I still find myself drawn to WoW-alike games (see my 17 posts about Champions Online), I am also looking forward to the next generation of MMOs. The question is: where do we go from here? I personally view MMOs as occurring in three broad generations based on the dominant games of their times: Ultima Online, Everquest, and World of Warcraft. Each new game reacts to the ones that came before them, but these three icons shaped the MMO landscape in ways that are far reaching. UO was the prototypical virtual world game. EQ went back to the MUDs to make it less world and more game. Blizzard designed WoW as if it was a game with virtual world trappings. That's only one vertical slice of the changes made over time. Each successive generation has built on the prior, tweaking, modifying, and eventually challenging the precepts of the earlier games. Games like Warhammer Online and Champions Online have tried to improve on the WoW model. But they are firmly in this generation, just like DAoC and CoH/CoV were in the EQ generation. It takes more than iteration to make that kind of change. World of Warcraft and Guild Wars ushered in the newest MMO generation, not by mimicking EQ, but by challenging the assumptions it was built on. For those of you looking for the next big things, that's the hurdle some company has to overcome. Most of the ideas I read in the blogging community about how to make a better MMO relate to pushing them one direction or the other on the simulationist/gamist axis. Others just want to roll back the clock on MMOs so they play just like the good old days. Which is ironic for people waiting for something new. Innovation is not easy. Some day, someone brilliant will have a flash and MMOs won't be the same. That's not me. It's not most people I know. Until then, we are most like going to see iterative designs where new ideas are folded into a proven mix. And every so often, we'll get something crazy like EVE Online or Darkfall to fill a sadly ignored niche. If you are bored with MMOs, I don't think there is much hope for you. Change is going to be slow (unless something brilliant happens). But change will happen. Maybe everyone should step away from the genre for a few years. Eventually you'll actually be able to notice a difference. Champions is not supposed to be easy and will be balanced so that content is a challenge to players. If any particular enemies are too powerful, submit a bug report. Cryptic is looking for alternate ways to provide Nemesis clues to high level players. Viewing weapon models in the character creator is on the developer's to-do list. Additional content will be rolled out over the next several weeks to plug leveling gaps. Cryptic wants to add additional functionality to the Powerhouse to allow better testing of powers. As well, they want to create "duel-free areas" to keep duelists from interrupting other players, such as in Powerhouse's trainer room and Club Caprice. Retconning specific powers would be nice, but is not currently feasible from a technological perspective. They are balancing the economy in relation to retconning, but the balance is not yet correct. They are still building an inventory for the C Store and won't open it until there is enough. The bean-counters haven't gone over pricing yet, so there's in nothing to report. The next zones released will be urban based as they were the most requested during beta. They are investigating changing tint values of powers (to get darker and lighter colors) as well as the current hue shifting. Any problems you have with Melee powers (damage or roots) are your own. Or maybe a bug. Report as necessary. Sorcery is getting a major overhaul to make it more fun and less of a hassle. Cryptic would like to add a Two-Handed Weapon power set. And they're going to be big. Celestial is intended as a support power set, but is designed to not require other powers to make the theme work. RE: the Containment Bubble power: You're doing it wrong. However, they may reconsider the power if players don't figure out how the designers intended it to be used. The Claws melee power set is intended to be highly efficient and includes debuff (Shredded) to improve DPS for the whole group. Also, evidently you should stack Dex. Daeke: Thanks for joining us today. Daeke: We've got a ton of questions to get through, so let's do some quick introductions. Chronomancer: Hey, everyone! Bill here - looking forward to answering your questions today. Daeke: Rekhan's here too, but he's shy. Daeke: Alright, let's get this party started. [Doomaflatchi] What would you say is your mission statement in regards to game balance? I think it would benefit the player community to get some kind of understanding of where you want this to go. Do you plan on focusing the game's balance more towards the needs of PVP, or PVE? Do you plan on making balance support specialization, or taking powers from multiple trees? Will your general strategy be to greatly lower the strength of overused powers and slowly work them back up, or decrease their strength slowly over several updates? Chronomancer: The goal is to have you feel challenged enough that being a hero means something without being frustrated or feeling overwhelmed. As you can expect, it isn’t easy, and no MMO comes out perfectly balanced. But we’re dedicated to getting there. PVE is the main focus of the game, but we’ve found that our PVP system is fun and popular. As for a focus on balance, the game should be fun for both styles of play. We’ll continue to create new content for both PVE and PVP. As for support, there are powersets already that are more geared towards this. Sorcery is a good example. The upcoming Celestial set is going to be great for players that want to focus on support powers, as well. As for balancing, our goal is to only decrease the effectiveness of powers if they are honestly broken (doing multiples of expected damage, for example). It’s better for us focus on fixing broken powers that aren’t effective enough before we lower the effectiveness of powers. [Thrusty] What is the current vision for the game? Has it changed since the headstart? If so, how? What are your top concerns as the game stands now? Chronomancer: Our top concerns are what are concerning you as players. We’re running as fast as we can to address issues, work on the overall balance of the game, and be as responsive to possible. There wasn’t a vision change that happened from head start to live – what you saw was us working to put the game on the right pace and balance. We’re continuously pulling data, talking to players, playing the game ourselves, and looking at how to make this the best experience possible. [Fives] Question: I know the launch day patch will be covered, however I wanted to know specifically about the damage and health of Villian level mobs. The game seems nicely challenging outside Villians, which are brutal ESPECIALLY in pairs. [SilverChaos] What is the reasoning behind the "Overturn and then slowly readjust the course" method of balancing that Cryptic has been using? I think it's clear that almost every one of your customers would prefer if you applied a %30 nerf to damage in 10% intervals over 3 patches, rather than 50% in one patch and then toning it down several patches later. Chronomancer: The large changes we made to the game recently were made to help bring the difficulty of the game into line. There was very little to no challenge to the game, so we had to make a major adjustment for day one. Let’s be honest – we never intended for heroes to solo content that was meant for groups of heroes, and we had address it with a major move. We know this came as a shock to our early start players, and we’ve taken (and continue to take) steps to improve our communication with the players. We’re also working hard to avoid large changes like these in the future and you will hopefully see a more gradual approach going forward. [Theik] My question: Will we ever see any indoor nemesis minion ambushes? For a level 40, only getting ambushed outside is a pain, as it pretty much forces you to go grind mobs trying to get ambushed for nemesis clues. Arkayne: Currently, we're looking at different ways to deliver Nemesis content to the players. We started with persistent world clue drops, but are looking at incorporating them into instanced maps, from contacts, or possibly even through the mail system. We'll test to see what works well. Ignoble: We are still working on the pricing of the retcon system and will make changes as needed. We are actively working on additional functionality for the retcon system, as well. Some of the changes that have been requested are more complicated than others and so they'll require time from the technology team. Our goal with the retcon system is to provide targeted retcons for characters that are specifically affected by changes. For example, if we made a significant change to a powerset - or even a single power - we could issue a retcon to just the heroes affected by that change. [Afoaa] Why did you make such a freeform character build system when you also made the world so harsh that most "for fun" builds are unplayable? Ignoble: While it is possible to build characters of widely varying power levels, we don't believe the fun builds are unplayable. Some builds need different play styles than others. A "glass cannon" has to play differently than a "tank" for example. That being said, we're also constantly evaluating the powers and will be making changes to fix ones that are broken or underpowered. We don't want you to be able to make "broken" heroes. If there are specific powers, areas, groups, or villains that you feel are disproportionately out of balance please let us know and we'll look into them. [Revik] Q: Why do meleer's get the weakest roots when we need it the most due to Charge skills being rendered useless if they just back away. [Shiroi98] question 2: when will melee powers supposedly do more dmg than ranged? it was suppose to be initially. Balseraph: Melee powers, based on how you're stated, do between 30% more damage than ranged powers over the same period of time, for the same cost. Some players have the impression that melee attacks are weaker than some ranged powers, because some fully charged melee attacks don't do as much damage as some fully charged ranged attacks. Well, that's true, until you look at the time it took to make the attack. Most melee attacks get fully charged in just 1 second or less, compared to a 2.5 to 3 seconds for some ranged attacks. Melee attacks can get up to an additional 20% bonus to their damage from your strength score. This bonus is completely separate and distinct from you Characteristic Focus bonus; it's in addition to that. We just put a change in where you need much less strength to get to that 20% bonus. The intent of this change was to allow melee builds that didn't focus on strength to be more viable. You still need to pay attention to it with your gear, but its no longer required that it be your Characteristic Focus (i.e. Super Strength) to get the full benefit. [NeoWolf] Question: will we EVER be able to see weapons in the costume creator/tailor screen before we have to pay to add or recolor them? AntiProton: We totally want to get that working eventually, yes. What just got in with being able to select them in character creator (though not see them) was ahead of schedule, which is awesome. The artist that did the setup work for the weapon geos to even be able to be swapable and I both really want to see it fully working in both the tailor and the character creator. Like a lot of features we had to put it on hold for launch, but now that we are released it is on the list of things to get done. [Dawnfire] Question: When will some more costume pieces be added? Will any of them be free or will all new pieces be only from the shop? Also will we ever get halfskirts? Skirts that only drape down in the back that is. Chronomancer: We're adding more costume pieces for everyone in the Bloodmoon event! These will be both character and account-wide grants. We're also working on some account-wide costuming choices that will be earned by jumping onto the Public Test Server and helping us get patches tested and ready for the live server. I'm not sure about the plans for half-skirts, but I know that the character team really wants to add more and more diversity to the costume system. [Antis3al] What are your plans to fix the leveling gaps? A player can still level if they dig for every single quest out there, but currently they don't connect in any logical way; and the content is still spread thin, sometimes requiring a player to do quests several levels above their own. Is there a coming solution or even awareness of the problem? Ignoble: We are currently working to add a number of additional missions and instanced content to help fill several content gaps we have identified. These will begin making their way out to the server over the next few weeks and will hopefully integrate seamlessly with the content that already exists. [Azrael_9] Which 'problem' areas are Cryptic going to address and fix first? Any in particular? Chronomancer: Currently we are focusing primarily on the balance of the game, such as powers issues and critter difficulty, along with content gaps that have been found. While doing this we’re keeping an eye out for any game breaking problems and will give priority to issues that need to be fixed immediately. The community team is also tracking all of the top issues through the forums and getting those in front of the development team. [Fives] Question: Danger room style add-on for the Power House where you can test powers on spawned mob waves. Probably instanced. Right now it's hard to test CC in there especially. Feasable? Related: [DarkShrike] Question: Are there any plans to add a 'power free' area to the power house so we can work on our builds without constant dueling going on around us? Arkayne: The Powerhouse has been received very well by the community and we'd like to add more functionality to it. We're looking into tech now which will allow us to create "duel-free" areas so people doing power selection won't be interrupted by overzealous duellers, and possibly an instanced test area where you can test your powers versus different opponents. This would also allow us to define duel-free areas in areas commonly requested like Club Caprice. [ian33w] Is it possible to increase the range of Sorcery's Auras as most powers are 50 to 100 feet? [Erebuss] Why was the decision made to completely change the game on Launch day after thousands of people had gotten used to a completely different game during early access? When do you plan to make it fun again? Chronomancer: We’re always going to be looking at balance and working to make the game a fun challenge. But the key there is that the game has to have SOME challenge to it. While it’s great to just mow down groups of 5 enemies that are 4 levels above you, gamers get tired of it pretty quickly when there’s never a risk of being defeated. No one wants the game to feel trivial because you don’t feel like a hero if you’re never challenged. That also doesn’t mean as a hero you should be defeated by a single guy with a baseball bat. We’re looking at all the enemies in the game and seeing where the aberrations in the overall power curve happens. And we’ll continue to smooth out the rough patches while finding the right balance. [Wraithed] Did you learn anything about player reaction from your post-launch patch? If so, what? Chronomancer: We know that our community is passionate and vocal, and that’s what helps us make a better game. We saw all of this in the beta, and honestly it’s good to see that our live players have the same excitement and hopes for the game. The only thing that is disappointing is when players make the assumption that the developers are doing things to “screw them.” We’re making a game that has to appeal to a massively diverse audience, and it is impossible that everyone will be happy with any change, no matter how positive. We’ll always be looking to refine the game, be responsive to the community, and make this something we’ll ALL be playing for years to come. [Vahn] Q: in single blade powerset, why theres no love for two handed weapons? [Junkbox] Are all power trees going to be given the necessity skills to be able to function within themselves? I understand you want people to mix and match powers, but I think a large part of the outcry besides the turtle-play style of the game is that most power sets can't function that well within themselves. Ignoble: We're going to keep evaluating sets and add in powers as they make sense. Some of the sets are designed to cross-over (the martial arts groups, for example) but we'll also do everything possible to make sure that you don't get "shut out" by staying thematic. The upcoming Celestial set that will release with Blood Moon is designed with this in mind. [Dawnfire] Question: What kind of set will Celestial be? What will it's passive be? Balseraph: Celestial - A support set that really pushes flexibility over raw power, every power will have at least two distinct uses depending on [secret sauce]. The passive for the set emphasizes this. We're building this set this way because we love you, and we hate sleeping or ever going home. [TheHeroFactory] What is the business/dev teams using as a benchmark to determine the "balance" of the game? Is it solely community outcry or a more objective measurement scale? Ignoble: We use both the feedback from the community and an objective measuring scale when working on game balance. There are times when we may think we have things dialed in from our scale, but when the community gets to it things our scale could never account for come into play and so we'll need to revisit content based on that feedback. For the objective scale we take things into account such as the damage the encounter in question does to the hero, how long on average a fight is intended to last, how many of a specific type of this enemy is a hero supposed to be able to take on at once, etc. and then the scale also changes based on if the content is intended to be solo or group oriented. [ian33w] question: What are your expected level ranges for the Bloodmoon event to complete all of the event content? Arkayne: Blood Moon is designed to be playable in all post-crisis areas except Lemuria (sorry, fish-men! we'll have something special for you later!). [WebGuest69] What are the end game plans for champions online? What reasons are there to continue to keep playing a character after you hit the level cap? Chronomancer: We have end game content in several areas of the game: PVP, Crafting, Missions, Perks, and Nemesis. All of these systems have content that you can only accomplish after reaching level 40. The Stronghold Apocalypse opens in PVP. There are crafting components that can only be gained in level 40+ maps and the blueprints to use those are going in soon. The daily UNITY hot-spots and repeatable high-end lairs are in for mission-fiends There are very long-term perks that will require lots of play to accomplish. And you can build and defeat up to 18 different Nemesis. The best part is we're going to build on all of these systems moving forward as well as creating new end-game things for heroes to do. [Cartigan] Do you guys, the people actually developing, spend any time playing this game on the public server? Chronomancer: Most of us here at Cryptic play on the live servers (as well as the public test shard) and many of us are playing through and leveling up right alongside all of you. As would be expected this helps us see your point of view better and even allows us to catch issues that may not have been found otherwise. Playing the game you’re working on is essential. Chronomancer: My main is a TK-user and I'm not only playing, I'm also working on my first machinima music video starring his awesomeness. Arkayne: Heck yah! I've got some pure framework builds, plus trying out a number of cross-framework builds to see what plays well. I'll be busy playing for years. Years! [CapnGeiger] Question: Is Hellgate: London openly discussed around the office? Or do you guys awkwardly go silent whenever Roeper walks in a room? Chronomancer: First of all, you can at LEAST spell my name right. I mean - come on! Secondly, everyone here has successes and failures in their background, and we learn a lot from all of it. I love working with this team, and I'm looking forward to doing so for a long time. AntiProton: Hellgate London was an interesting game, it definitely had some stuff we could learn from. Also, we love making fun of Bill. [Kahleek] Will we ever be able to cherry pick which powers to retcon? Chronomancer: While this seems like it would be simple, it actually isn’t. With all of the associated characteristics, talents, advantages, tier requirements and so on, it is difficult to just pull out a power in the middle of the stack, as it were. Making a change like this will require a lot of work on the technology side, so unfortunately while we’re looking into it, it won’t be any time soon. [Per_Ignim] Question: Is it intended that a full retcon cost more than 50 times as much as it is reasonable to expect a character to have at any given level? Balseraph: Retconning and the Economy: First, there isn't enough money flowing into the game right now. This is a completely known issue, and we have several different options that we're testing. Basically, yes, we knowingly erred on the side of a too restrictive money supply to see what trends happened, and be able to catch issues (like dupe bugs) very quickly. Now we're getting ready to make some significant changes to drop rates of items and resources from critters... and all of them are basically going to be "more". =) The question, of course, is how much more; since neither we nor you wants the economy to be something that changes several times. For retcons in specific, I think that the cost scaling when you go deep might be found to be too high even after we've inflated the economy to where we want it to be. If so, well, we'll change it. Easy. The current balance goal is that all of the money you earn in a SINGLE level should allow you to retcon back FIVE steps. [Vapur] Will we ever be able to have costume pieces unlocked and made account wide? Restricting them to one character is silly as when you goto make alts you don't have them lovely costume options available to you to help create new concept chars. Ignoble: There are going to be costume pieces that can be unlocked at an account level, and others that are only for the characters that earned them. The ones for individual characters are a way to show off your status, to show that you accomplished a certain feat. That's one of the reasons we give you extra costume slots - so you can change your look to show those things off if you want to. Other costume pieces will be unlocked at an account level so all of your characters can get them. [NeoWolf] Question: When will the C Store be fully up and running and how much will extra slots cost? Chronomancer: We're building a lot of fun stuff for the C Store right now and when we have a real inventory for people to choose from, we'll open the doors! We don't have final pricing set for individual items or on what I think of account-management tools (like adding character slots). I expect we'll have this run through the money-minders in the next couple of weeks and when we know, we'll make pages on the website showing off all the goodies to come along with pricing. [draulfox] Question: How often do you guys visit the suggestion forums ? When you do, do you go back many pages and read every thread? How do you select what you read? Daeke: Every day. A ton of the higher-ups here are always asking us what players want to see most in the game (aside from the constant balancing and fixes that may be needed). I go through and collect a bunch of the most popular ideas and pass them on. We also grab ones that we happen to think are really cool ideas as well. In fact, earlier in the chat we took a question about adding a "Danger Room" to the Power House, and I definitely remember seeing that in the Suggestions forum. So, even though we don't respond to the Suggestions forum very often, we're definitely following it very closely. [Dawnfire] Question: Will Containment Bubble's have their shield reconsidered? Right now it's far weaker then just about any other hold since it makes the target near invincible for the duration. Balseraph: Containment Bubble: Compare the cost of Containment Bubble to any of the other holds that can affect Master Villains or players with full energy; it's significantly cheaper to use. Containment Field represents a very specific tactical choice; When used against a single member of a *group* of enemies, it leaves you with much more energy to deal with the other enemies. This behavior is accentuated by the advantages for Force Blast and Force Detonation that cause it to erupt into a huge AoE explosion. To be honest, if not for PvP considerations, I'd be inclined to make those powers strengthen and prolong the hold / shield rather than consume it. That being said, a lot of people misunderstand the benefits / optimal use of this power, I'll be watching feedback, and I'm open to changing it in the future if most players don't get / don't like it. And yes, having Detonation's advantage consume it isn't a bad idea at all as a potential "best of both worlds" option. [freakigod] QUESTION: Do the develeopers play in groups to test the lairs and how agro works, or is that not important to the development of the game? AntiProton: We do play in groups, and we do test the lairs. We've been in a bit of a moving target situation with the march up to release, and now that things are mostly settled (inasmuch as anything in an MMO ever is), we can fine tune it. Aggro was intended to create the frenetic feel of how comic book combat feels not allow a traditional MMO tank to hold all the aggro. The current issue with the improper critter aggro is totally not the intended dynamic and we are working on some solutions to that. It may be through further work on the powers and advantages that are intended to have aggro effects, or it may be through AI changes, adding some values to the roles, or some combination of all three. I personally definitely have had some frustrating aggro experiences while grouping on Fight Club, and we are discussing it and working on it. Group play needs to be fun, we like playing that way! [WebGuest99] Will there be a Moon/Space Zone in the future? And what other new Zones can we expect to see in the future? Chronomancer: The biggest feedback that we received from players in the beta was requesting more city-based content. The first new zones we'd be looking to create would take that firmly into account. Of course, we're going to continue to create various places in - and outside - our world to explore. Balseraph: Claws powers: Claws powers are intended to inflict excellent damage over time for their energy cost. If it isn't, we'll look at it. Additionally, the "Shredded" debuff that they can inflict raises not only your own dps, but that of every team mate with you. That being said, Claws is a crit - happy set, and you should really spec for a high crit rate to get the most out of it. [Feigr] Question: Are there any plans to add a gray scale the palette for powers? Chronomancer: We're looking into the potential technical issue behind this (hues vs tints) but we have heard your desires and are working to make it happen! I know I'd use it to make a noir munitions character. Daeke: And with that, our time is up! Daeke: Thank you to everyone for joining us. I'm sure someone's going to post a transcript to this on the forums, so we'll make sure to call it out on our website. Chronomancer: Thanks for coming out, everyone! It was great to be able to answer your questions! AntiProton: Ok, talk to you all later, it was fun. :) See you on the forums.